BAT - BLOG : BATMAN TOYS and COLLECTIBLES: #BATMAN Spotted on #JOKER Car During Filming of SUICIDE SQUAD Movie in Toronto, Canada! #BATMAN Spotted on #JOKER Car During Filming of SUICIDE SQUAD Movie in Toronto, Canada! 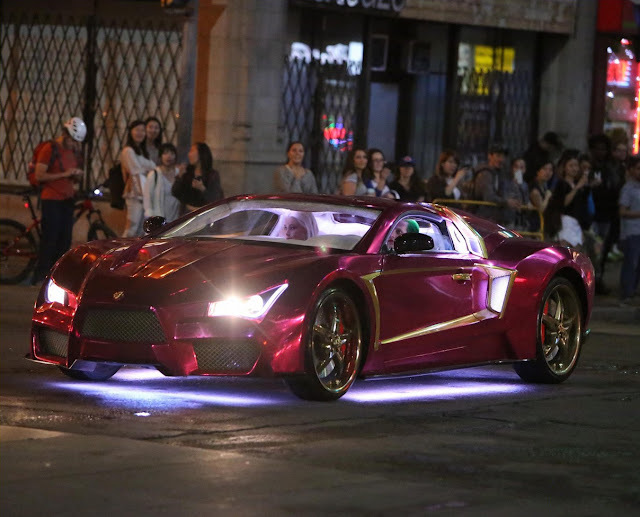 Just a few days ago the Internet practically blew-up with the news (and tons of photos and video footage) of the Batmobile Prop Car making an appearance in the new SUICIDE SQUAD Movie. Now, there is a bunch of hype about BATMAN making an appearance. In this video right here we get to see the Caped Crusader (Stunt Man) riding on top of the Joker's car! People are already starting to call this vehicle, the "Joker Lambo" because, well duh, it's a Lamborghini! Oh yeah, here's a better, sharper, photo of the Joker Lambo, or as I like to call it, the Jokermobile!